Orig published there Jan. 17, 2009. 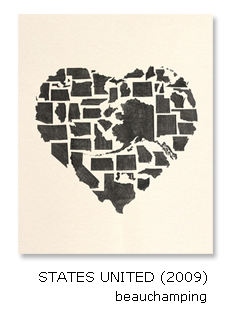 The US goes by the motto In God We Trust (but only since 1956, when it replaced the ‘unofficial’ motto, E pluribus unum). A motto (from the Italian word for pledge, plural mottos or mottoes) describes a quality or intention that a group of people aim to live up to – a mission statement of sorts. As such, America’s newer motto has invited more controversy than the older one, since it seems to run counter to the principle of separation of church and state. Its introduction did seem to make sense at the time, what with the Cold War against those godless communists. 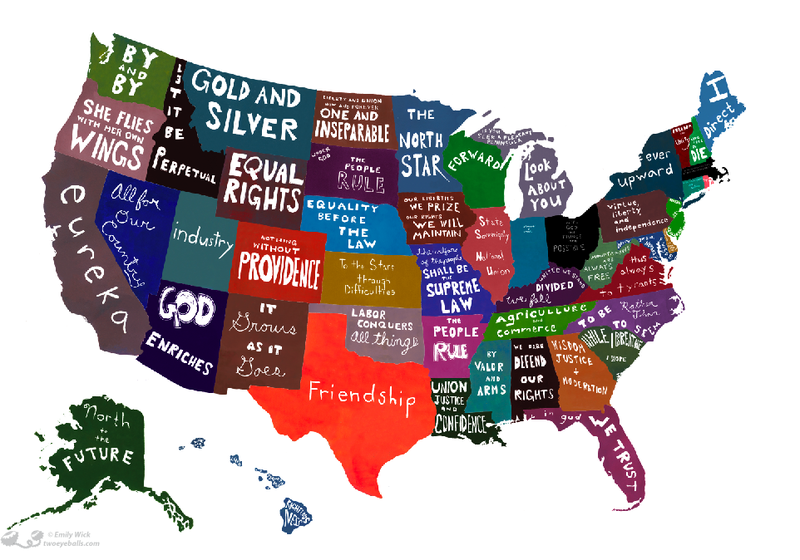 As demonstrated on this map, the 50 states making up the US each have their own motto too. The two-and-a-half score state mottos display a wide variety, of quotations, languages and underlying messages. English is the favourite language, but not even by half: only 24 state mottos are originally in English; Latin, once the language for all solemn occacions (and not just exorcisms), accounts for 20. Two mottos are in native languages, and French, Spanish, Italian and Greek account for one each. The system of checks and balances seems to work for mottos too: if the national motto is overtly religious, then only six of the state ones refer to God, either directly or obliquely. Most deal with secular rights, and the readiness to defend them. The Bible is tied with Cicero as the source for the most mottos (three), while classical literature has proven a particularly fertile breeding ground for inspirational quotes (mottos originate with Lucretius, Aesop, Virgil, Brutus and Archimedes). Satellite navigation (SatNav) is a lot older than previously thought. In fact, it’s even decades older than man-made satellites themselves. This fantastic contraption, called the ‘Routefinder’, showed 1920s drivers in the UK the roads they were travelling down, gave them the mileage covered and told them to stop when they came at journey’s end. The technology – a curious cross between the space age and the stone age – consisted of a little map scroll inside a watch, to be ’scrolled’ (hence the word) as the driver moved along on the map. A multitude of scrolls could be fitted in the watch to suit the particular trip the driver fancied taking. The system has several obvious drawbacks – a limited number of available journeys, and the inability of the system to respond to sudden changes of direction. Also: no warning of road works or traffic jams ahead. Not that there were that many traffic jams in 1920s Britain. 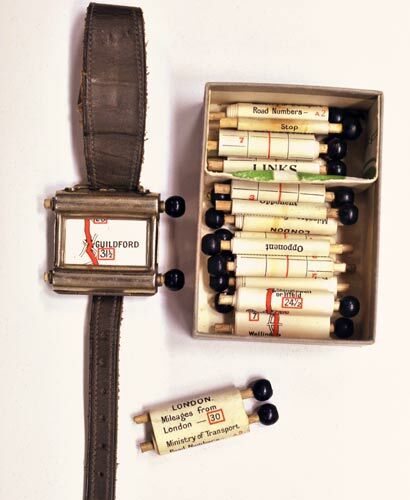 The Routefinder, one of many bizarre patented gadgets now on display at the British Library, didn’t take off because there were too few drivers, i.e. potential customers, at that time in Britain. Or maybe also because it was a bit impractical, distracting drivers from what they were supposed to watch – the road. Many thanks to Toni Hudzina for sending in a link to this story (here on ananova).